It will be a while before Adele literally splits her Grammy with an AI, but Amper's software will nonetheless receive appreciation for its attempt to democratize music composition and production. It takes too much talent to compose good music and too much know-how to produce it. Thankfully, the musically challenged among us can now get a little help from our artificially intelligent friends. 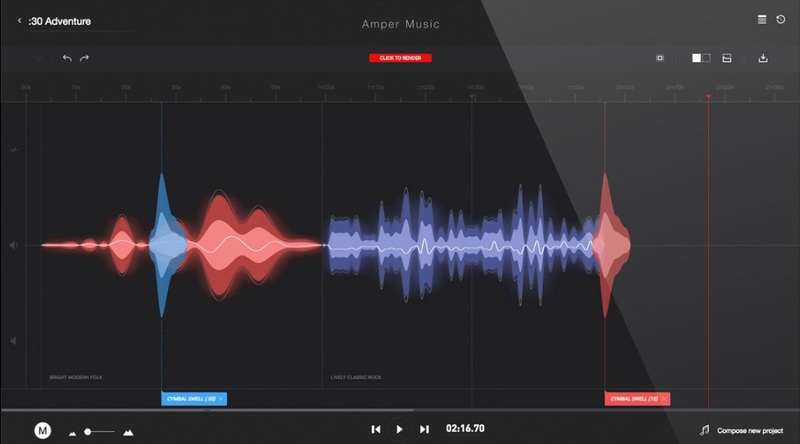 With more than three years of R&D and extensive sample libraries under its belt, Amper has created a way for anyone to compose original music using AI-backed software. Investors also think that’s friggin’ awesome, which is why Amper is richer by $4 million post its seed funding round. To make composition as simple as possible, Amper lets users work with pre-defined styles of music and modularized instrument groups which can be integrated into tracks with one click. Compared to the years of practice that goes into learning to play an instrument, that’s really simple. Amper starts off by asking for a choice of genre for your AI-enabled masterpiece. Right now, four broad styles of are available: Classic Rock, Modern Folk, 90’s Pop, and Cinematic. Within the chosen genre, you’re asked to pick a mood for the piece. Some of the options under the 90’s Pop genre are Exciting, Playful, Sad, and Driving (whatever that means). The moods for the Cinematic genre sound a little cooler: Dramatic Tension, Epic Percussion, Dark Atmospheric, and other options that sound like Hans Zimmer’s brief for the Dark Knight theme. In the next stage, the software goes into a little bit more detail. There are various options for the kind of instrumentation desired under the ‘Custom Band’ tab. There, you can choose whether you’d like to include certain percussive elements, or leave out the synth, or keep the synth and leave out the keys, or….you get the idea. Then you pick a tempo and duration, and you’re ready to render the piece. If you like what you hear, Amper lets you download the music in MP3 or WAV formats. If not, you can either tweak the input or just ask the software to produce a different piece of music within the same input parameters. As of now, the software is being aimed at both individual content creators looking for affordable royalty free music, as well as big publishers needing an easy way to beef up their repertoire of stock tunes. Amper currently names Hearst Television and Associated Press among the list of clients using it as a tool for music creation and production. Two Sigma Ventures led the startup’s $4 million seed funding round. Other investors include Advancit Capital, KiwiVenture, Foundry Group. Previously, Amper raised an undisclosed amount in venture funding from HDS Capital. If you have ever tried to make your own music clip, you know that it is not an easy task. It is also one that takes a bit of time to master. i like the idea that I can get a little help while at the same time adding some of my own elements. I have been trying to make my own music for videos that I shoot a long time. It is not that easy of a thing to do when you do not have the composers ear, so to speak. This makes that part of the process a little easier. I will be trying it out for sure! Thank you for sharing. I am starting to see a lot more of technology like this. AI is really going to make things more efficient while at the same time, adding “originality” to things with the push of a button, right? Sort of. You are really not getting anything original since it is based on what is available within the program. However, by changing a few things here and there, you can make a song a little more your own.